I told myself I’d be more involved after submitting this time, but I let the Holidays get the better of me. I guess I still have a little bit of time to get a postmortem in. As always, I’m blown away at the creativity and ingenuity of everyone’s submissions. There are always more to play then I ever find time to get around to. Was happy to experiment with music this time. I didn’t get to practice as much as I had hoped between Ludums, but I made a push before the compo started to learn the basics of MilyTracker and was able to produce a loop that I hope wasn’t too annoying. Made a time table this time and did pretty well sticking to it. Taking time up front to plan out and schedule makes a huge difference. Liked the look of my art (much more than last time). I think I made some simple choices that allowed me to get a look that I liked in a short amount of time. Actually finished in time to enter the Compo! I tried to stay away from “snake/nibble” games as I figured they would be in abundance. When I started on Friday, I created a prototype for a procedural side-scrolling runner that involved using one button to grow the player and another to grow the world (shrinking the player). The problem was the procedural world was either too difficult or didn’t work well in the puzzle aspect I wanted. Once I realized I was designing levels, I didn’t want to fall into the same trap as last time. So I went to bed, that idea scrapped and no new idea. When I awoke I had an idea for a much simpler mechanic of a guy that that could either a) turn a crank to charge a battery/light or b) shine the light. The light would in turn keep the monsters surrounding our player at bay. The goal was to see if you could manage the two tasks and see how long you could survive as the resolve of the monsters would increase. I proceeded to code the prototype for this idea. While designing visuals for the prototype, I somehow let the idea become warped and started messing around with the mechanic. I never really took the time to evaluate the whole picture/project as I kept making tweaks and changes. This was my ultimate mistake. In the end, the final game mechanic feels very muddied and confusing. I look forward to April and entering my third LudumDare, where I hope to expand on what I’ve learned through these past two weekends. Thanks to everyone that has already tried and commented and Happy New Year. If you haven’t had a chance, you can try out ‘The Cube of Zanigriv’ here. First of all, if you haven’t tried the game, take a look at it! The idea of making a team first appeared on the discord gamedev group. We all got hyped and a gigantic team was assembled. Of course, on the day before LD a lot of the members left. The final team was composed of soso (the LD account we used), mahham (meee), odyssey and muddmaker. Yoohooyuzu (the artist) had some internet connection problems so we had to go with programmer art. A few hours in we had the idea of making an RTS in which you, the immune system, fight a virus which wants to grow. The hex grid was in our minds all along. I (mahham) chose to make the hex grid work, since i fell in love with them a few years ago after reading this beautifully written article. I think i made it work in about an hour. In the meantime, the others were working on entities. That code was horrible and we scratched it. We later decided to refactor the hex code. After refactoring around 1/2 of the code, muddmaker left. Soso and I worked on a hexagonal map and buildings. When muddmaker came online after a few hours, he got mad at us for not making a tower defense game. Wait a second… tower defense? We were making an RTS, right? Yeah, he misunderstood it. He left the team. So now we’re only 3 out of the original 8. I’m not sure when, but around this time we changed the game from immune system vs biological virus to antivirus vs computer virus. Now we only needed more buildings, the virus AI and A LOT of tweaking. The buildings were slowly but steadily made. After a few hours of trying to make it work I realised it’s too hard, so I went for another AI idea, in which the virus will place buildings in order to get to a certain predefined configuration (always the same). That worked out pretty well, but it needed some tweaking. While I was working on the AI, soso made the shop work. At the beginning of the third day, we had the basic game almost finished and I had to fake a disease in order to not go to school. After I finished the AI, soso said that we have no time for our own music so we instead went with using NCS music. He started working on the main menu and a popup that showed when a song started playing while I searched for some fitting music. I did a horrible job. The music was way too distracting for anyone to concentrate on the game, but I didn’t realise that until the jam was over. Another problem that occured at the beginning was git. We weren’t familiar with it and the conflicts were hell, breaking the code EVERY SINGLE DAMN TIME. Mount FuJ is a take on tower defense, or defend the castle style games. You play as an active volcano trying to protect the village that has popped up just below at your base. The village is under siege from an unknown enemy that is sending wave after wave of pikemen and horsemen units. The village will fight back, but it is no match for the army. You must use your volcanic ways to rain down lava balls on the enemy before all of the buildings are destroyed. This was Zoe’s first game jam, and first game related project. Loi and Myself have been working together since Ludum Dare 30, and have formed Roaring Cat Games under which we publish our work. Our team formed as we were brainstorming at the live Ludum Dare meetup with GameDevLou. This was the first time that Loi and I have worked with a dedicated musician and sound designer (which was awesome). Zoe used Logic Pro to record, mix, and compose music. She user her Casio Privia PX-160 keyboard as a midi controller to write the segments needed for composition. Loi used his usual package of Adobe products but heavily worked in Photoshop to generate the art assets. However, this jam, he added a new tool into the mix with Spriter2D. Spriter really let him focus on the art and fluidity of the animations when during previous jams he was having to worry more about manually framing animation sizes and pivot points. I chose to go with libGDX for this game jam as it is the framework I have the most experience with for games. While I’ve been doing some 3D work and learning unity since Ludum Dare 33, we knew we wanted to go with a 2D game for this jam, and I wanted to eliminate engine knowledge as a possible roadblock. We always like to challenge ourselves in some way with our projects though, so I did decide to throw Ashley ECS into the mix. I had used it for LD33, but only sort of embraced the ECS approach. For tooling I used: IntelliJ as an IDE, GIMP for placeholder art, and Git for version control. When we got to the end, our top 3 ideas were between a Growing Sword hack’n’slash, One-Punch Main Training Sim, and a combo of Volcano and Protect the Iceberg. As a whole we were most interested in the One-Punch Man game, as it had the opportunity for lots of humor, and working with a story/world we all enjoyed. However, as we started designing out how the game would play, we realized that the mini-games were fun as a concept, but boring in actual gameplay. We came to the conclusion that we couldn’t make the game fun enough to move forward on. Next in line was the Hack’n’Slash with a growing sword. We discussed it, and the game play was going to be pretty simple and fun, and the environment had a lot of potential for interesting visuals and sound. Unfortunately, once we started looking at some of the features that would need to be implemented and the number of animations and art assets required to match our vision, we realized that the scope was just a bit too much. I personally had some major concerns that I wouldn’t be able to figure out how to implement the sword mechanics we wanted in code. I kind of regret giving into that fear looking back, but it was probably the right call. Loi can blame me for dashing his Hack’n’Slash dreams until the next jam. As we began finalizing our third choice, the volcano game, we all kind of realized it might fit our strengths really well. Zoe seemed confident that she could produce the tense, dramatic soundscape we were designing toward. Loi found the concept might lend itself to a painted style he’d been wanting to try out. I felt there were some interesting challenges in the code, especially with only my second project using Ashley ECS, but was all doable in a Jam time-frame. On top of this, once we all got on board, we began expanding some of the possible mechanics, and the game was sounding pretty fun. Our process for building out the game was straightforward. While there was no intention this jam of keeping Loi and Zoe from playing the game until the end of the jam…it still happened. Due to the development tools, having the game up and running where we can all play it isn’t as simple as I’d like it to be. This means that unless everyone on the team sets up their machine for development, the only way to play is to jump on my machine. I think we should have done more small 5 to 15 minute breaks where we all get together to test a mechanic, listen to a piece of music, or analyze an animation or set of art assets as a group. This is something that was missing from our process this Jam, and I think it did limit what we accomplished. The art and music for the game turned out fantastic. Zoe and Loi nailed it, and I love the feel of the game with them in combination. The soundtrack is nice and tense, with a subtle yet still noticeable buildup of urgency. Combined with the SFX and the lava animations, it makes for a very cacophonous battlefield scene. Yet, somehow with all the explosions and battlefield tension, there is a soothing calm to the experience as well. About halfway through the jam I could see that the music and art were going to need to take the main focus of the game. The collaboration between the team went smoothly. We were each able to spend the majority of our time in our own tasks but were able to stop and discuss next steps/changes as needed without any issues. I think being in the same location really helped with that, and I can’t recommend enough that you try to join a real-world meetup if possible. Coming together on Monday after our day jobs, we were able to pull off a lot of work right at the end. Sunday at the end of our day, we barely had a game. The wave system didn’t work, there were no sound effects, there was no balance to the enemies, and worst of all the game didn’t do anything to highlight the great soundtrack. On Monday we were able to take a step back, prioritize the features to make it a game, and knock them out with just a few minutes to spare for submission. This final crunch period went really well, and it was very satisfying to see how quickly we could get things accomplished under pressure. Coming up with a damn name for the game… This is the first jam I feel like we never had a clue what to call the game. If anyone has any great ideas for what this game should be called leave it in the comments below. We were just drawing blanks the whole time. I definitely should have started working on having the lava destroy enemies much sooner as that is the key mechanic of the game. I had the lava-firing and charging really quick, and it then just didn’t do anything with it for almost 24 hours. I made the mistake of not building the basic mechanic up front so we have time to tweak and make it fun. On the plus side, I’ve learned that lesson (for at least the second time now! :)) and will be able to remember this instance to hopefully keep it in my mind going forward. In the end, we feel our game has a pretty fun mechanic hidden inside of it. We’d like to tweak some of the known issues (spamming lava is an auto-win, no visual indicator to know how charged up your lava is) and add touch controls. This would allow us to release the game out for mobile devices as a little time sink. We’ll definitely need a scoring system, and a way to indicate that fun you’ve lost. The win sequence needs some work as well. “So, the whole week leading up to Ludum Dare 34, I was filled with excitement! Excited to create something new! Excited to take a break from RCG’s personal 3D project and get back into designing 2D characters and environments again. In the days leading up to the Jam, I started playing around in Spriter 2D (an animation creation and management program that I had been wanting to learn since the last Ludum Dare), because I was looking forward to making a hack and slash. Spriter 2D would have been perfect for animating action frames, as one of its unique features is bone-rigging and attaching them body parts and objects. Spriter 2D was very productive; it saved me a lot of time with image file management, ease of exporting animated frames, and having a simpler, yet more extensive, animating options that were non-existent in Photoshop. It allowed me to focus more on content creation rather than spending a lot of time on filename and manual frames export, which can be tedious and time-consuming when you trying to create a smooth animation sequence. As always, I wanted to challenge myself to a new art style every Jam. This time, it was watercoloring in Photoshop. I haven’t used watercolor paint since I was a wee-lad, and picking it back up again felt a bit strange, especially now that I am doing it digitally and my paint brush is my tablet pen. The hardest part in the beginning for me was getting the brush settings just right to give it that wet outer-edge water-effect look. Below is my custom brush settings that I used throughout the Jam (works best with a drawing tablet, as it emulates brush pressure and strokes). It was nice to use watercolor inside of photoshop without the mess to clean up afterwards”. Hello all! I figured it was about time for me to do a post mortem for my game! After the hectic ludum dare weekend, It’s always nice to circle back around and put my thoughts to paper about how the weekend went after a bit of reflection. This is my 5th Ludum dare I’ve participated in, and I usually participate once a year or so as a holiday tradition. My day job is a software engineer working on financial software (boring stuff), so I have a background in programming in the first place. I am not, however, anywhere near competent in the graphics or audio department. This was a pretty big deciding factor in the aesthetics of my game. I figured I may as well go purposefully bad for comedic sake rather than try to do something and come out as unintentional poor quality. So from the outset, I was planning on doing something space/star wars related due to the upcoming release of the new movie. Just figured it would be a fun tie-in. I was planning this well before the theme was announced. I had some tentative plans to work with maybe a couple different people, however that ended up not amounting to anything, so about 3-4 days before beginning I was for sure going to be on my own. Without someone more competent to put together my audio and visual needs, I went with an idea I had sort of brewing in the back of mind, using construction paper/crayons to come up with my graphics! 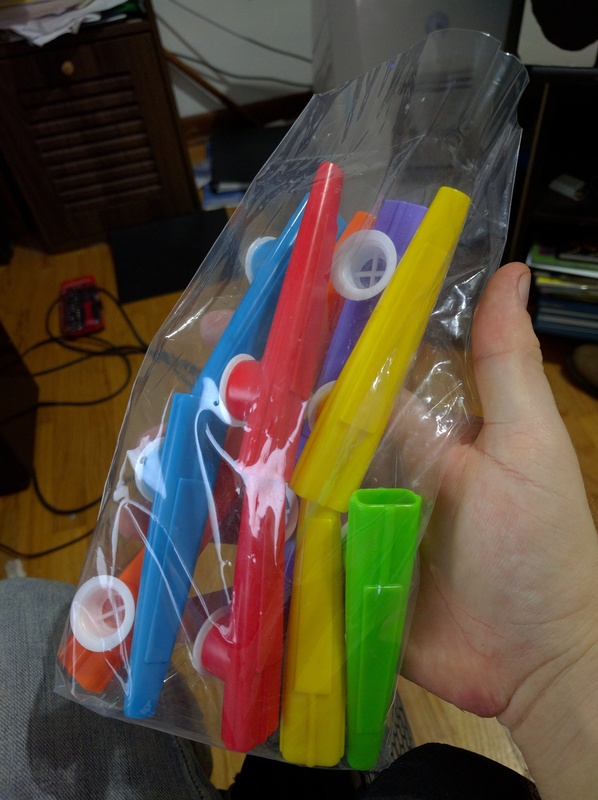 In addition, I decided I would record all of my sound effects myself, with the thoughts of using a kazoo for music. Like i said above, going full on intentionally bad was my goal here. By Friday evening, I had a pretty good idea of what I was planning on doing. I watched the theme voting with interest, but was hoping the theme would end up aligning with my plans. Earlier in the day, I ran out to the store to grab some craft supplies/kazoos (i still have a pretty large bag of ’em, apparently I can’t just buy ONE kazoo…) and of course a supply of caffeine. Lucky for me, the theme ended up aligning perfectly with my idea, or at least half of it did. Grow fit perfectly into my plan, but two button controls didn’t really fit all that well. Fortunately, we were able to do one or the other if we wanted, not necessarily both. So with theme determined, supplies in hand, and ideas fresh in my mind, I set off from the announcement of the theme working on my game. Theme announcement for me, locally, happens around 8 PM, so I had a good few hours in the evening to work. I set about getting the basics of player movement down, as well as adding some interaction mechanics between the player and enemies. At some point in there, I was able to get to adding in my background. So i ended up wrapping up the first portion of the day around 1-2 AM my time, and decide to wrap it up for the evening and try to get some sleep. I was pretty pleased with my progress so far, because the first portion of this event for me is usually coming up with a plan and ideas. This time, I actually had some tangible progress on an idea, which was going to make things easier for me down the line. So I begin the next day (but still LD day 1) around 8 AM, and before jumping straight into working, I decide to fix myself a nice breakfast to prepare myself for the coming work. Once all that was squared away, I set about immediately working on the bulk of my game. Overall, it was clear, steady progress down the line as I worked on mechanics and took breaks from coding to get down to the serious business of construction paper and crayons, or to record some more sounds, and the occasional snack/sanity break. I took some time out of my day to acquaint myself with some new features of unity 5 while i was at it. At some point during the day, I decided I needed some cut scenes to really tie the whole package together. Luckily, these were pretty easy to implement. In case you couldn’t tell, the dialogue was mostly ad-libbed (hard to tell, right?). I recorded a handful of variations that all hit right about the same points on each and took the ones I felt were the best. It was about this time I was beginning to realize I had a masterpiece coming together in my hands. So on the final day (Sunday) i decided I earned a bit of rest, so I slept in a bit. Got up around 10 AM or so. I was pretty confident I would be done on time, and I spent most of the day tightening up some mechanics, and eventually I decided that the boss needed some retooling. In previous versions, I toyed around with the bosses movement mostly, and I couldn’t find a really workable solution. Either he moved too fast and was basically impossible, or he moved too slow, and was a joke. Eventually, I decided that I needed a new mechanic to make a boss fight work, because it was either a simple slog through a massive HP pool, or an insta-gib for the player. That’s when i decided to add in the bullet hell/shooter mechanics to the game (player firing shots, boss with giant beams), and these features came together pretty quickly and worked out pretty well. I finally had a final boss I was happy with. After getting the game into its completed state, I decided to try getting a working build put together. This proved to be (oddly) the biggest roadblock I had come to so far. I was determined to use Unity’s new WebGL build, but to my surprise, the build kept clocking in at insanely huge (for the scope of my game) sizes. I’m talking the first build hitting about 250 MB. And actually playing it would take ages to load, in excess of 20-30 minutes. This was, of course, a BIG problem. 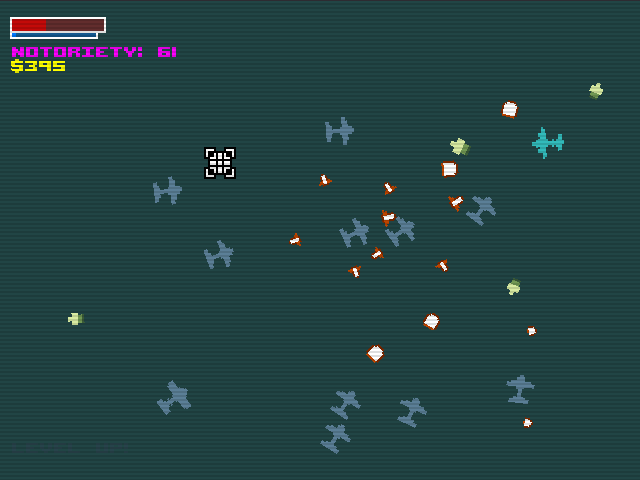 However, this being ludum dare, it didn’t surprise me in the slightest that SOMETHING went wrong. Up until now, it had been way too smooth, and I was quite suspicious. So, with nothing left to do, I buckled up my big boy pants, and began researching my issue, trying to figure out what could be the problem. The total raw game assets came to about 100 MB (high DPI PNG scans and high quality OGG vorbis sounds), still pretty big, but nothing like the final build. So the obvious thing to start with was to start scaling down my assets to something more manageable in size. Cue a few hours of tinkering with all of the images and sounds until I reduce my asset size down to around 30 MB. After i get everything to a quality i’m happy with and a more manageable size, my builds were still clocking in around 150 MB, so I only ended up shaving off about 100 MB. At this point, I’m completely puzzled at what could possibly be causing my build size to be so large. So i take to google searching for all the information i can concerning unity 5 and large WebGL builds. Many hours of googling later, I eventually come upon a post in the unity forums recommending someone to turn down the material quality to lower their build size for a 2D pixel art game. Little did I know, I had struck on gold here that pointed me in the right direction. Turned out, all of my image assets were being imported into unity with a default texture max size of 2048, which was significantly more than needed for the assets i was using. A bit more tinkering later, I figured out I could very easily turn this setting down to 512 with almost no discernible quality loss. And most importantly, the builds were clocking in around 20 MB afterwards, which was far more reasonable. Along with the smaller size, the load times were reduced greatly (to a minute or so). With all this completed, and a final, working build, I still had about 45 minutes until the end of the competition. So with my head held I high, and my kazoo rendition of the star wars theme still stuck in my head, i proceeded to play my game one last time to snag a few screenshots, and ultimately submit my game about 30 minutes early. It was a long weekend, but well worth it. I felt good about the product I had made, and hoped it would go over well, and currently that does seem to be the case, which makes me all the more proud of it! Over the weekend, I was able to play around with some new features of Unity I hadn’t ever really used in the past, and was able to bring my game to fruition pretty exactly as I have originally envisioned. It’s not often in a Ludum Dare that one gets to say this, so I was particularly proud. At the end of the day, had I previously familiarized myself with some of the newer aspects of unity (and WebGL builds specifically) I could have saved myself a lot of headache and stress right up at the end there. Fortunately, things worked out for the best. The game itself brings nothing new to the table, and relies solely on its parody value. However, I’ve learned in the past that setting out to break new ground during a Ludum Dare is a very risky proposition, so I feel justified in my decision to play it safe in terms of mechanics and game play. Thanks for reading, everyone! Hope you enjoy mine and many other of these fine games that are part of Ludum Dare 34! In the end my son and I were talking about what cool ideas others had implemented for the two button control theme. We joked about it would be fun if you used ALT-F4 as the control keys – so he quickly made a simple sprite animation and I threw together an even simpler game in my hosted SuperPowers IDE. Quite happy with the results considering we only spent about 3-4 hours doing the game and we used a hosted IDE to program it. This game was incredibly challenging for me to finish within the deadline. I can’t describe the feeling of joy I am getting watching players connect and pilot their goofy little amoebas around trying to eat each other. Separating the servers from the game was a mistake though, which is obvious to me now. It is confusing to have to keep a separate server window open and confusion keeps the player count low, which is death for a multiplayer game. I was terrified of latency since I am in Europe so I wanted to make sure everyone could connect to a local server. I should have just made one server and dealt with the lag. Most of my reviews are saying my game is just a copy of Agar.io. For some reason this is getting under my skin so I have to rant about it before I snap and yell at my dog. First Rant: Do you go around to every one of the 100s of platform games and leave reviews saying they are “Basically just copying Mario Brothers”? Space Amoebas is about using planets gravity to propel yourself around in space to eat small enemies or hide from big ones. Yes, in my game you eat dots too. So did Pacman. What is your point? Second Rant: Have you ever tried to make “Just a copy of Agar.io” in 48 hours before? It was really freakin hard. I wish there was a category for Technical Achievement which I think I would do well in since I don’t think anyone has made a WebRTC game with synchronized physics for LD before. The best I can hope for is Innovation, which I will do terrible in because my game is “just a copy of Agar.io”. Do I look like Agar to you? Well, do I punk?! Third Rant: This rant is aimed at myself. I swore I would never make another multiplayer game for a compo. It is so disheartening to see players have connected, bopped around for a few seconds without seeing another player, and leaving again. The whole, complicated system is working (miraculously) but there are no players to interact with so the game is boring. I really planned to write some AI but I ran out of time. Fourth Rant: One side effect of writing a server for the compo is that I can see exacly how long each player has connected before leaving again. I can see you people. All but a few of the users who have left reviews spent less than one minute in the game. Some about 15 seconds!! Is that how much time you are spending on all of the games you review!? Are you just padding your coolness score? Why not just look at the screenshots and base your review on them? Seriously though, thanks everyone who has tried my game and left feedback so far. Feedback is like gold. So it’s been a mixed weekend for for me especially with the 34th LDJam. I’m sad to say that I couldn’t get anything up this time as once again I think I over done everything on the actual project itself. In the end I had a playable game which would loop through and randomly generated dungeons. The gameplay itself was a click to move kind of game with basic path finding (thanks to Quill18’s tutorials on youtube.) where you had to go through different dungeons collecting scrolls before reaching the final level and destroying the boss. The controls were already set out for using a mouse with right click and left click only. I stuck to one idea and evolved it to suit all of the final themes. Had an outline and todo list of items that had to be done and kept to it. I now have a character that I want to develop on for a series of projects next year. Focusing on my work rather than getting side tracked by social media. Knowing when to stop and wind down. Having a few game breaking bugs that I obsessed over. One bug took almost 2 -3 hours to track down and fix. Not keeping the design of the game simple. Getting distracted by other people and being in areas of distraction. What have I gained from all this? So all in all it was a pretty good run even though I didn’t manage to get anything pushed out again. But I did manage to learn a fair bit about path finding and that having a “World” and randomly generated “levels” actually works really well. I gained a character design that I plan to use in a few of my small projects next year. So if you want to keep up to date with what I do follow me on twitter @moongateuk, Like the Moongate Games UK page or keep an eye on moongate-uk.co.uk. Keep up the gamedev everyone.